A couple of months ago, when I started writing, I decided to do a little research on Points of View (POV). You see, when you write, the easiest Point of View to write in, is First Person (any other writers out there that find the opposite, would love to hear it in the comments). First person POV is comfortable; you identify much better with your main character, you are in his/her head, thoughts, feelings, and writing comes easier. HOWEVER, it’s not always the best, it´s limiting. You have to be careful how to handle other scenes where your character is not present (which is difficult). So of course I started to write in Third Person POV, but that’s not the topic of this post. When I was doing the research, I found a group post discussing this topic and a comment from someone recommending “The Art of Racing in the Rain” by Garth Stein (sorry I can’t remember who commented this, if you’re out there reading this post, please let me know it was you who posted the comment to thank you). The comment suggested that you could also use something original as the POV of a dog; yes you read that well, a dog! which I found hilarious. Being an animal lover, I´ve always been interested in knowing what was going on in my dog’s head whenever she had her puppy eyes directed to me. 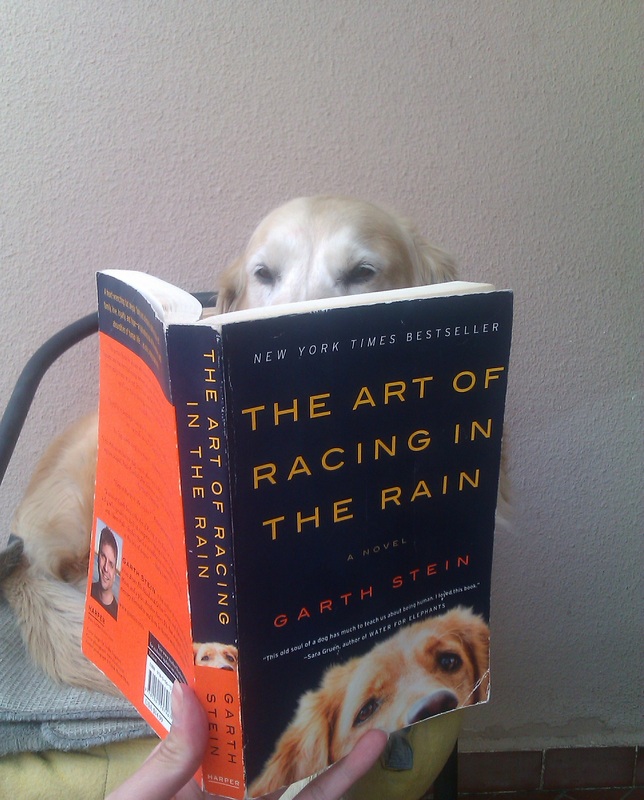 So I immediately added the suggested book “The Art of Racing in the Rain” by Garth Stein to my Amazon shopping cart, and one month and a half later (yes, it takes that long to reach my country) the book was in my hands. The art of writing books is related to how you engage readers to your characters, how believable and appealing they are. I’ve never imagined a dog would create such a big connection. I loved this book, even if you’re not into racing cars – a topic Enzo is an expert on – you’ll still enjoy the story deeply. I would definitely recommend this book.